The Bobcats returned home riding a six-game winning streak to face the Georgia Southern Eagles to begin Sun Belt Conference play. That streak is now over. Morgan Robinson of Georgia Southern hit a two-run homerun to right field in the first inning to put the Eagles up early. A few innings later Georgia Southern extended their lead when an error on a pop up scored Lydia Witkowski and Taylor Rodgers. The Bobcats, who had never lost to Georgia Southern, were trailing 4-0 at the top of the fifth. The Bobcat offense could not find a way through the whole afternoon. 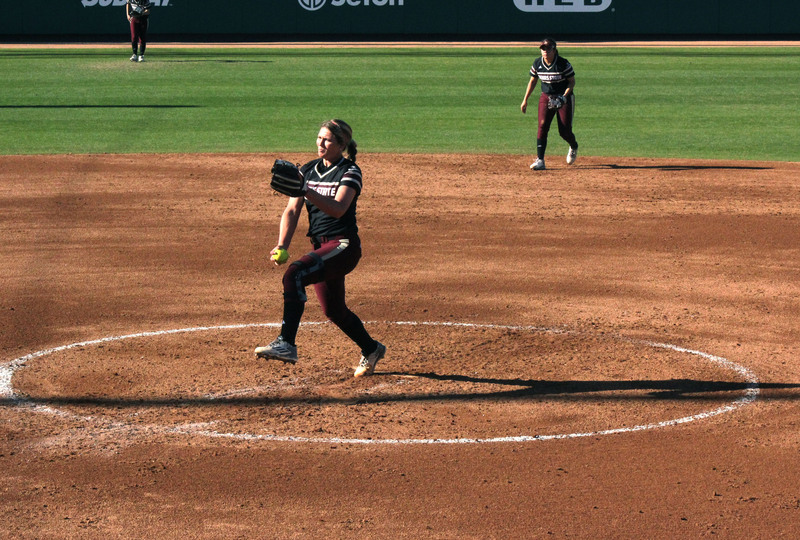 Aside from that, sophomore Randi Rupp had a great outing as she threw 11 strikeouts. A leadoff homerun from Corrina Liscano at the bottom of the 7th was the only run of game one for the Bobcats. Texas State also dropped the second game to Georgia Southern Eagles as pitcher Paige Williams gets her second loss of the season. The game started similar to Saturday’s as the Eagles led 2-0 at the end of the first inning. The lead by Georgia Southern would extend to 4-0 at the end of the fourth inning. A late rally by the Bobcats would come short on game two of the series ending with a 5-4 score. Texas State earned their first victory in Sun Belt Conference play when they defeated Georgia Southern in game three of the series on Sunday. Rupp had a complete game shutout which enabled Kelli Baker and Kimberlin Naivar to score the only runs of the game. Texas State improved to an 18-7 overall record. The Bobcats will hit the road for the next five games, starting with Texas A&M-Corpus on Tuesday at 3 p.m..
Next Next post: Say What About Dating?